George Farmer reviews the range of complete soil substrates from HELP. 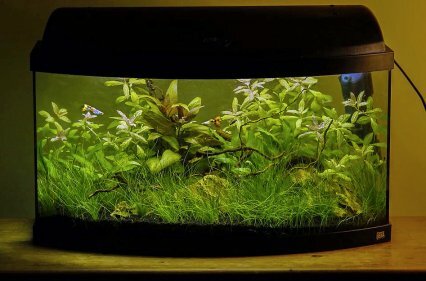 There are many soils now available for the planted tank hobbyist. However, HELP (High quality Easy treatment Low Price) Advanced Soil is a little different in that it offers three varieties. The basic variety, known simply as Advanced Soil, performs like many other soils on the market. It reduces pH and KH and buffers the pH at approximately 6.5. This makes it ideal for fish that prefer softer and more acidic water. The soil is almost black in colour, making it an effective contrast against livestock, and the grain size ranges from 1 to 4mm. The manufacturer says it’s an entirely natural product, so plant and wood matter may float to the surface during initial installation. The other two varieties of HELP Advanced Soil are tailored towards shrimp keepers and plant growers. These are essentially the same product as the plain Advanced Soil but with additives. The Shrimp product contains added humic acids that are said to assist in the nurturing of baby shrimp, while the Plants variety has added nutrients in the form of nitrogen, phosphorus and potassium (NPK). The low-energy aquascape above has been set up with HELP Advanced Soil (Plants) and does not receive any liquid fertiliser. A shrimp and planted aquarium set-up after several months using HELP Advanced Soil (Shrimp). 1. No installation rinse or other softeners. This makes it ideal for keeping softwater species without having to use other softening techniques, such as reverse osmosis (RO) water. Rinsing the product before installation should not be undertaken, unlike other gravels and sand. 2. Ideal for plant growth. I’ve noticed the soil granules are firmer than some others on the market and do not decompose into a mud-like sludge so quickly. Typically, I would expect sludging to occur after around 12 months, rather than the four to six months I’ve experienced with some other soils. This makes it an attractive contrast for any plants as well as livestock. Advanced Soil (Plants) is a proven performer: I have successfully grown healthy plants without the requirement for additional liquid fertilisers in a low-energy system. In a CO2 injected set-up with moderate to high lighting, however, I would recommended adding additional nutrients to ensure the plants do not go hungry. It does not compact like sand, so it can be used to create relatively deep areas in the aquarium that can be useful for various aquascaping techniques. 6. Creates a stable environment. It does not give an ammonia spike unlike some other soils on the market. A solid performer that provides some unique selling points in the form of three varieties and no ammonia spike after installation. The firmer grains are also a welcome addition to prevent the soil from turning into a mud-like sludge too quickly. Availability is currently low in the UK, but I expect this to change soon.